How Contagious is Taiwan’s Democracy? Reporting for this article was supported by the Pulitzer Center on Crisis Reporting. The old barriers have crumbled, the old animosities have abated, and as a result, millions of people from the authoritarian mainland of China now spend various lengths of time on democratic Taiwan. In fact, the two-way traffic is tremendous. On average, about 11,000 mainland tourists arrive every day at Taiwan’s Taoyuan Airport. Several thousand mainland students are studying at Taiwan’s colleges and universities. It’s just as quick, and almost as administratively easy, for a Taiwanese to fly from Taipei to Beijing, Shanghai, or Canton as it is for a New Yorker to go to Washington, D.C. It is an indication of the pace of change that eight years ago when the current policy of building contacts was agreed upon by the two sides, the number of tourists, students, and direct flights was respectively zero, zero, and zero. 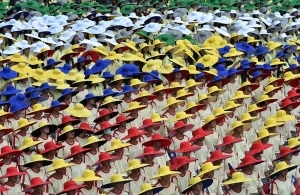 Students wearing colourful hats attend a National Day ceremony in Taipei on October 10, 2015. An obvious and important question is whether this will have what might be called a subversive, even possibly a transformative effect, on those coming from the mainland and whether that might lead to change in a China that, these days, seems to be going in the other direction. Similar questions have been raised more generally about China’s opening up: whether, for example, students studying at American universities will go home imbued with liberal-democratic ideas that will foster a political opening up in the People’s Republic. But Taiwan is in its own category, much closer to home for a person from China. It is the only stable, prosperous democracy ever to exist on a substantial portion of Chinese territory, and therefore, perhaps, it is seen as proof, contrary to the official position on the matter, that democracy could work in China as a whole. Just now, for example, Taiwan is embarking on the sixth free presidential election campaign ever to take place in Taiwan’s, or China’s history, one that the DPP, a formerly banned, implicitly pro-independence party, some of whose leaders have been political prisoners, is expected to win. How does such a spectacle appear to visitors from the mainland? Certainly, mainland visitors can do things on Taiwan that they couldn’t do back home. 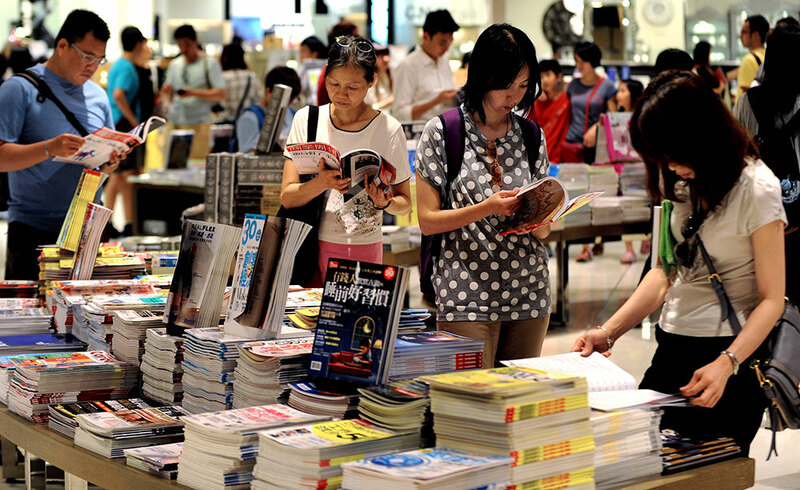 One of the standard stops on the tourist itinerary, for example, is the banned-books table at the Eslite Bookstore, a Barnes & Noble-like emporium in an upscale Taipei shopping mall, where every day plenty of mainland visitors can be seen thumbing through works they would never find on a bookstore shelf back home. There are books on such topics as the 1989 student uprising in Beijing and its violent suppression; there’s Xi Jinping: China’s Emperor, whose title suggests it is a not-very-flattering biography of China’s current party leader and president. People were perusing China’s Future Freedom by the Nobel peace laureate Liu Xiaobo, who is currently serving an eleven-year sentence for “subversion of state power,” his crime having been to disseminate ideas similar to those in his book and similar to those that now flourish on Taiwan. Readers pour over books in an Eslite Bookstore in Taipei. Eslite was established in Taipei in 1989 with a focus on art and humanities-related books. Now Eslite has more than 40 branches, attracting locals and tourists. I’ve been told by Chinese friends in Beijing that mainlanders frequently smuggle some of these books back home in their luggage. But while being in a Chinese place where these books are available probably has some significance for mainland visitors, it’s hard to say what if any effect Taiwan’s soft power might have on Chinese visitors. For what it’s worth, my efforts to talk to the P.R.C. visitors at Eslite were unsuccessful. None of them wanted to talk to a foreign journalist, whether out of the fear that they could face penalties for doing so back home or because they simply had no interest. I had better luck with mainland students, three of whom talked with me one afternoon at a cafe near the prestigious National Taiwan University (NTU) where they are all graduate students. It was an admittedly small sample, but for these three students experiencing a Chinese democracy was a deeply meaningful experience, even an inspirational one. At the same time, they all doubted whether the example of democracy on Taiwan would have much of an impact either on their own behavior when they returned to China or on the Chinese political future more generally. ...with Taiwan, you can imagine China differently. Scholars might dispute parts of that statement, given that Taiwan was under Japanese colonial control from 1895 to 1945, which did not produce a liberal-democratic culture on Taiwan though it did raise the educational level well above that on the mainland. Even before the Nationalists took refuge on Taiwan in 1949, after losing the civil war to the Communists, they had imposed a brutally repressive right-wing dictatorship, ruthlessly and murderously suppressing a dissident movement that arose in 1947. That dictatorship then lasted for about forty years. The present-day democracy that emerged in the 1990s was in part the result of a social movement from below, fomented especially by native Taiwanese who had always resented the paramount power of the mainlanders, but it was also a top-down reform agreed to by the mainland élite. So, does Taiwan inspire mainlanders to imagine China differently? Here it must be noted that China’s rulers don’t seem especially worried that they will, or at least they don’t worry so much that they have put any breaks on their policy of expanding ties with Taiwan. Or they are confident that they can control whatever subversive effects the democratic example of Taiwan might bring about. The students I spoke to at NTU seemed to agree on the matter of Beijing’s capacity to contain the ideological damage. One of them was Lin Yangyi (also not her real name), a passionate, articulate young woman studying communications, who reminded me of American student radicals of the sixties and seventies. She was a declared “leftist,” as she put it, who became active last year in the student protests against a trade agreement with China that would have opened up service industries such as banking to trade and investment across the Taiwan Straits. Called the Sunflower Movement, the protest culminated in the occupation of the legislature, which forced the government of President Ma Ying-jeou reluctantly to shelve the new deal. “In China,” she said, “we learn about Marxism but nobody believes in it, but on Taiwan they really believe in it.” And, moreover, unlike on the mainland, where the last student demonstrations in 1989 took place before most current students were born, the students on Taiwan were able to organize themselves, to publicize their views, and to demonstrate. But the three students also allowed that they might be different from other mainland students in Taiwan, the majority of whom may not share their political views, or who have devoted themselves to their studies and not thought about politics much at all. They said that for most students from the P.R.C., the reason for coming to Taiwan is the quality of the education, which, they all agreed, was better than in China. There are more foreign-trained professors, and the technical levels are more advanced, more in tune with international standards. But Chinese students on Taiwan are probably not all that different from the much larger number of students who study in other countries, the largest number of them in the United States, where there has been some research on how much, if at all, their feelings about China are changed by the experience. One study, based on email surveys of 750 Chinese students at 100 American universities, published in 2013 in The Chinese Journal of International Politics, concluded that Chinese students have a “positive attitude” toward the United States, but they maintain “a strong attachment” to China. There have been any number of press articles in the past few years showing that Chinese students appreciate the greater personal freedom they have in America, but they are also angered by the intense American criticism of China; many of them feel alienated in an American society that, they feel, both stereotypes them and excludes them; they feel pride in China’s wealth and great power status; and they do not see such things as the political gridlock in Washington, or the American gun culture, or the country’s crumbling infrastructure as especially desirable. And then, of course, and perhaps most important, are the practical impediments in the way of mainland students’ acting on any pro-democracy convictions they acquire while abroad, including the obvious one that in authoritarian China the penalties for advocating liberal ideas in public can be very severe—witness the aforementioned Liu Xiaobo. Ultimately, the reason the mainland authorities do not seem especially worried about “spiritual pollution” being carried back to China from places like Taiwan is their confidence that they can repress it.